Looking for a cute little dessert for Valentine's Day﻿? 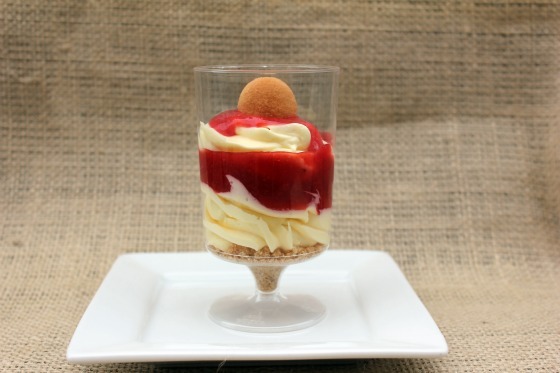 Cheesecake Shooters are small, but oh so yummy!! In your mixing bowl combine the cream cheese and sour cream until blended. Pour in the pudding mix, sugar and vanilla and mix on medium for 3 minutes more. Place in the refrigerator for at least 15 minutes. Crush the graham crackers in your food processor until just crumbs. Add in the butter and 1 T sugar and pulse until combined. Place in a small bowl and set aside. In your blender or food processor blend/pulse the cherry pie filling until it become syrup (no chunks left). You can make your own syrup from strawberries, blueberries, etc. instead of the pie filling if you have the time. Set aside. In the shooter cups, wine glasses or whatever you may be using, first spoon enough graham cracker mixture to cover the bottom. Spoon or pipe in some cheesecake, then spoon enough syrup in to cover the cheesecake. Repeat with a second layer of cheesecake. Place a few drops of syrup on top and swirl around for a spiral design by using a wooden toothpick or skewer. I garnished mine with mini Nilla wafers. *Congrats to Jenny for winning my Progesso Soup and The Biggest Loser Workout DVD!! Thanks to all that entered! so fun! When we were in disney and universal they seemed to have so many shooters, which was perfect because I am not supposed to have much sugar. I love this idea! what a great idea! so cute and great for a party! This would be great for family gatherings so that everybody will have a chance to taste it. Thanks.